I love any number of spices, rubs, sauces, grilled onions, mushrooms, crumbled blue cheese – just about anything on a steak. But sometimes ya just want a steak. An unadorned, on-the-grill, basic steak. And that’s what we had, tonight. We had a couple of nice strip steaks in the freezer that called my name this morning. 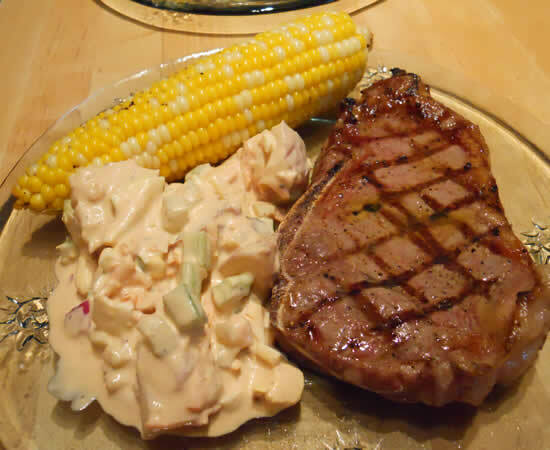 We also had a couple of ears of corn I bought yesterday – and potato salad I made yesterday. This was one easy meal! The corn went on first. Well-buttered and with salt and pepper, I wrapped it in foil and put it on the upper grill rack for about 10 minutes. The steaks got salt, pepper, and garlic – and onto the grill they went. I put the corn on the lower grates while the steaks cooked. A few minutes later, dinner was served.